There are many rumors buzzing around that iPad Air 2, the next generation of the popular iPad Air, is coming out in the near further this year. 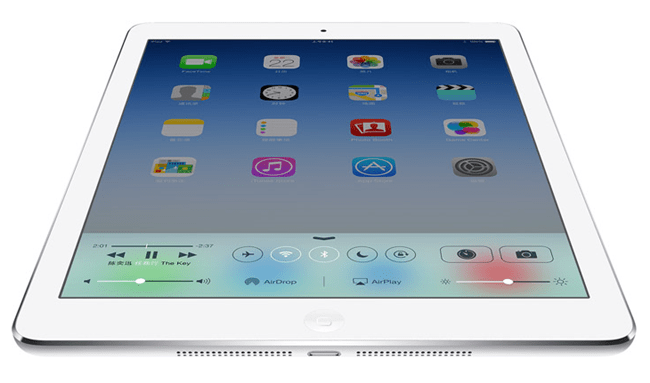 As the history of Apple suggests, minor improvements will be seen in iPad Air 2. Therefore, a good guess about what will be new about this long-awaited hardware has been taken among the users. Finally the world-anticipated iPad Air 2 is standing here. This brand-new Apple tablet is somehow even thinner than the original iPad Air, and the display technology is even better with 9.7-inch Touch ID screen with 1536 x 2048 pixels. And somehow, despite all the new technology Apple stuff into the tablet, it still gets 10 hours of battery life per charge. And the headline is the new A8X processor and M8 co-processor, giving the iPad Air 2 the speed bump we all expected. It's 40 percent faster (50 percent in certain apps) and has a GPU that's 2.5 times faster than the iPad Air's A7. The M8 processor can use the new barometer for measuring changes in elevation. You probably have noted that it will be terrific to watch videos on iPad Air 2. iPad Air 2 has larger screen than iPad while maintains the same high definition. More importantly, the new technology renders you a smooth playback of the motions. Last but not the least, it's equipped with a light chassis which makes it possible for you to enjoy videos freely. No.1 fast iPad Air 2 converter to convert MKV, MP4, FLV, AVI etc to iPad Air 2 (iPad Pro/mini 4 more) with the world's fast speed and excellent quality! Anyone knows that iPad Air 2, the new member of Apple big family, undoubtedly abides by its family tradition that only supports MP4, MOV, M4V video formats. So if you plan to watch MKV, AVI, FLV or MP4 file with bigger size on iPad Air 2, you should know to convert video to iPad Air 2 readable format is the priority to all. To convert video to iPad Air 2, the first thing you may have to know are the video formats this device supports. It can run with two formats: H.264 and MPEG-4. There are many video formats, including MKV, M2TS/MTS, AVCHD, AVI, WMV, FLV, MP4, RM, RMVB, etc. However, as you may see, not all the videos are in the formats iPad Air 2 supports, to convert videos to MP4/MPEG4/MP4 H264 that iPad Air 2 can read seems to be necessary. How to convert MKV AVI FLV video to iPad Air 2? 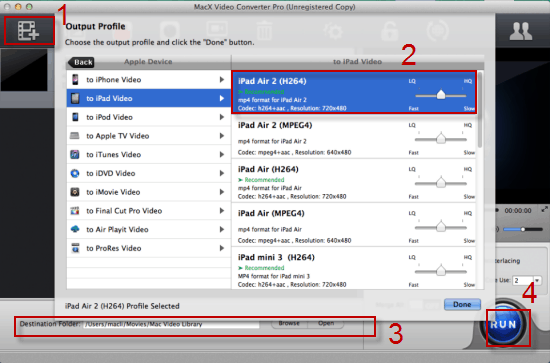 You can easily accomplish the video to iPad Air 2 conversion with a proper video converter. In this paper, an ideal iPad Air 2 video converter software is recommended: MacX Video Converter Pro. With this program, you can convert any video to iPad Air 2, iPad Air, iPad Mini 4 with Retina display, and etc 5x faster and no quality loss. What's more, the excellent YouTube downloading ability allows you to download Youtube video to iPad Air 2 for enjoying without network connection. Best-ever Video to iPad Air 2 Converter to Convert Videos to iPad Air 2 in a Few Clicks. Download this iPad Air 2 video converter for Mac or iPad Air 2 video converter for windows based on your operating system. Free download and launch this fabulous iPad Air 2 video converter and directly drag your video files to the software, or click "Add File" button to load the files. After loading source video, choose one output file you need. Here we take converting video to iPad Air 2 MP4 format for example. Just go Mac General Video - choose iPad Air 2 readable MP4 format as the output format. Besides, you can set the audio quality, frame rate, and other parameters as you like. Click the "Browse" button to choose the path where you want to save the output files. Click the "RUN" button to start converting video to iPad Air 2, you could view the whole conversion progress. In addition to convert MKV AVI FL V video to iPad Air 2, this versatile iPad video converter for Mac can convert HD videos from camcorders, all standard videos, online YouTube videos, etc for playing on the latest mobiles & tablets, including iPhone, iPad, Android, Samsung, WP8, PS4 etc. Furthermore, many other options are also available, including but not limited to downloading YouTube videos, making photo slideshow, recording screen, editing video. Do you want to convert video for playback on iPad tablet? This article shares 3 best video converter for iPad and tells you how to convert FLV AVI MKV M2TS to iPad (iPad 4/3/2, iPad Mini with Retina, iPad Air/2) viewable format easily with the best iPad video converter software. This article shares with you how to download video to iPad 2, download videos from YouTube or other online video website and convert video to iPad 2 for watch. Apple, the Apple logo, Mac, iPhone, iPad, iPod and iTunes are trademarks of Apple Inc, registered in the U.S. and other countries. Digiarty Software is not developed by or affiliated with Apple Inc.